I wore a neck tie three days last week and in tying my tie the other day I was considering going from the full windsor knot to the half windsor, or maybe the four in hand. My dad taught me how to tie a tie several years ago and the knot that he taught, and that he still uses to this day is the full windsor knot, but in recent years I’ve noticed that there are several men of prominence that appear to use the half windsor knot or the four in hand. The difference between the half windsor and the full windsor, as far as I can tell, is that the half windsor deals with one “loop around” one of the sides of the tie, whereas the full windsor throws another “loop around” into the mix. The four in hand knot is different all together(see here for an illustration of the differences.). One of the things I like about the half windsor and four in hand knots are that they are both smaller than the full windsor. The thing I like about the full windsor is the fact that it is more symetrical than the smaller two knots. In watching news coverage of the election the reporters, analysts, and talk show hosts seem to favor the smaller knots. 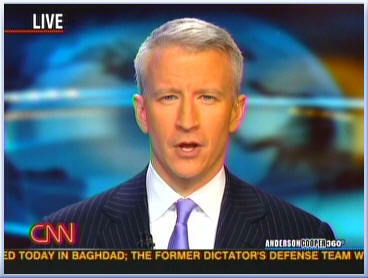 Take Anderson Cooper for example. His knot is far too small to be a full windsor knot. The knot is also slightly asymmetrical, with a slight tilt to Anderson’s right side, indicating that it is not a full windsor. 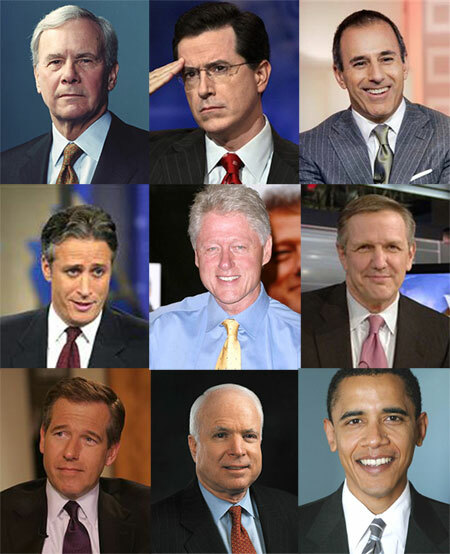 If we run through the gamut of male newscasters, the smaller knots seem to be the knots of choice. In fact, in my brief image search I couldn’t find an example of a full windsor wearer. Matt Lauer, Tom Brokaw, Charles Gibson, Brian Williams, John Stewart, and Steven Colbert all seem to prefer the asymmetrical, smaller knot variants. Even Charles Osgood seems to wear a half windsor knot when he’s not wearing a bow tie. Jay Leno, Conan O’Brien and Craig Ferguson all wear the smaller knots. In watching the news and late night shows, and in doing some online research it appears as though finding a full windsor on television is like getting a Yahtzee…kind of hard to come across, but I think I found a few. David Letterman and Rob Corddry wearing Full Windsors? The presidential candidates Obama and McCain both appear to go with the smaller knots. A recent article in Newsweek discusses what the choice of knot says about a candidate’s character. 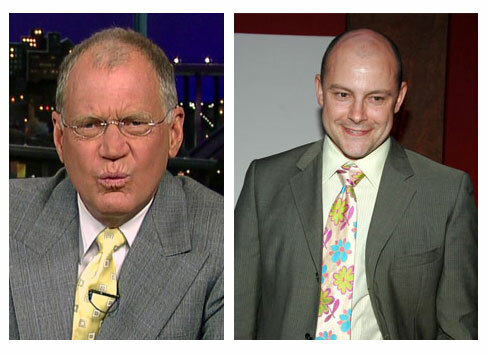 Looking back through photos of past presidents, Ronald Reagan appears to be the last president to wear the full windsor knot.David Letterman seems to wear a full windsor knot on occasion and so does The Daily Show’s Rob Corddry. Richard Nixon, Johnny Carson and Ed McMahon all seem to have worn full windsor’s back in the day. That’s about all I was able to find though in my brief search. According to my brief yet very scientific research it certainly seems as though the full windsor knot is out and the smaller half windsor and four in hand knots are the vogue. Even still, for now I’m sticking with the full windsor. I think the reason for this is that I like the symmetry present in the full windsor that isn’t there in the smaller knots. Perhaps this is a sign of a slight OCD within me; maybe I’m old fashion. At any rate you now catch a glimpse of the goofiness that goes on in my brain. While you’re listening intently to the election results, news stories, and late night talk shows; I’ve got my eye open for that one analyst that has a full windsor around his neck so that I can secretly yell ‘Yahtzee!’ in my head. Hello! I’m currently on a WordPress site. Sorry to disappoint. I have used Drupal in the past, but I’m probably not the best resource for backend Change Management Systems. Best of Luck! Very great post. I just stumbled upon your blog and wanted to say that I have truly loved browsing your weblog posts. After all I will be subscribing for your rss feed and I am hoping you write again soon! Hello there! This blog post could not be written much better! Reading through this post reminds me of my previous roommate! He always kept preaching about this. I am going to forward this information to him. Fairly certain he’s going to have a very good read. Thanks for sharing! I am really impressed with your writing skills and also with the layout on your weblog. Is this a paid theme or did you modify it yourself? Anyway keep up the nice quality writing, it is rare to see a great blog like this one these days. Thanks for ones marvelous posting! I definitely enjoyed reading it, you happen to be a great author.I will make sure to bookmark your blog and will often come back in the foreseeable future. I want to encourage you continue your great work, have a nice holiday weekend!